The presentation focused on Balls Food Stores' participation in the American Pharmacists Association (APhA) Foundation's Project: IMPACT Diabetes. With the passage of Kansas House Bill 2146, pharmacists in Kansas may now enter into collaborative practice agreements with physicians to provide team-based patient care. The session outlined the challenges and opportunities that Balls Food Stores faced in providing a disease state management (DSM) program. Roles for pharmacy technicians and resources needed for providing the services were also discussed. 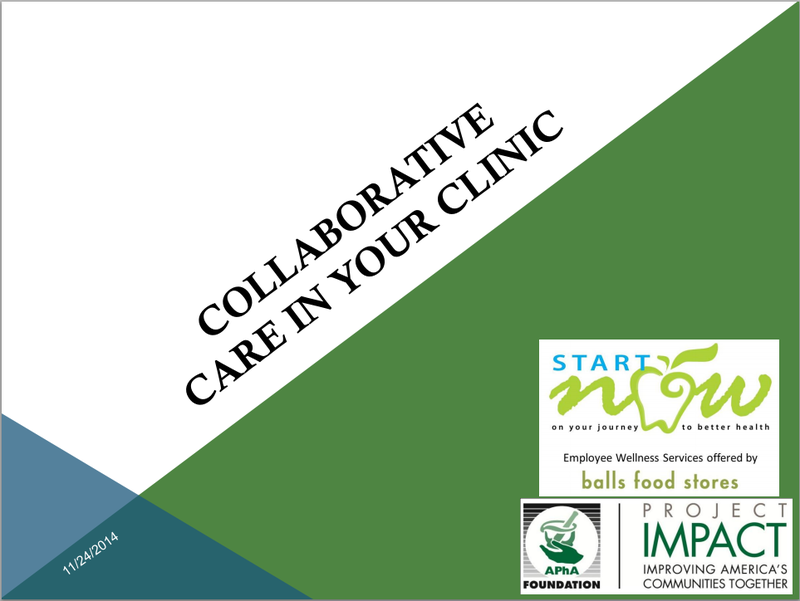 Feedback received from participant evaluations was positive, and questions asked during the presentation showed interest from other pharmacists in implementing similar programs/services. The Kansas Pharmacy Foundation invited Balls Food Stores to submit an Innovative Program application through the Kansas State Board of Pharmacy. They plan to pursue this application in conjunction with a collaborative practice initiative that expands the reach and scope of Project IMPACT: Diabetes. The Project IMPACT: Diabetes results from Balls Food Stores were presented. Presenters shared the intent and design of the project. 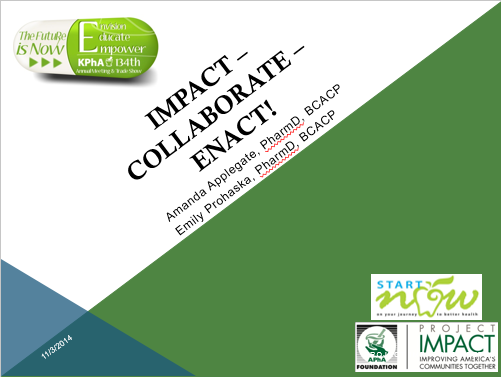 They also identified areas for potential collaboration through the Start Now program. The audience was impressed by national and local results as well as comprehensive level of care provided. The potential to collaborate by building a dispensing pharmacy on-site at the clinic that also provides patient care services was discussed.